The landmark Campanile, Trinity College Dublin. The college, established in 1592, is home to scholars and men of letters some famous, some forgotten. Among the blessed are Jonathan Swift, Oliver Goldsmith, Oscar Wilde and Samuel Beckett. Trinity College has a deservedly proud heritage. While it's not well known, the Irish, including some matriculating at Trinity, revel in the celebration of Somhain, a Halloween festival that includes a parade and boisterous bonhomie to mark the end of summer and All Saint's Eve. All holidays have special trappings and this one is no exception. The zealous celebrate with costumes and special food. 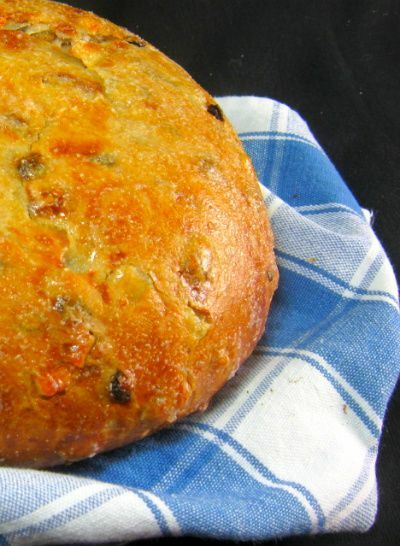 Some of the foods associated with the Somhain are colcannon, a potato dish, and barmbrack, a confection sweeter than a bread but less rich than cake. Both Van Morrison and James Joyce mention barmbrack, a yeasted sweet bread that's traditionally served on Halloween in Ireland. The Irish sometimes called it Báirín (top) Breac (dirty or speckled). Years ago the yeast to raise the bread dough was skimmed from the top of a vat of fermenting beer, the Bairin. The dried fruit was the Breac. It is the custom in Ireland to place trinkets into the bread dough. The charms determine if luck in the coming year will be good or bad. If a pea is found, the finder will not marry. If a coin is found, good fortune and wealth can be anticipated. A small stick indicates a bad or violent marriage, a piece of cloth poverty and a ring an impending marriage. Some cakes contain all these objects and fate is determined by what's in the slice of cake you receive. For the superstitious it's not unlike a crap shoot. Like many women, I seed my bread in such a way that only good luck is bestowed on any who are at my table. The bread is not difficult to make and I'm a bit surprised that the tradition has faded in so many Irish-American families. Soda bread is still made for St.Patrick's day but there are precious few families that still make barmbrack for Halloween. I have a pointer that will make your bread exceptional. In Ireland, the raisins and currants are steeped in tea for 24 hours before baking. At Chez Mary, they bathe in Jameson's Irish Whiskey. I have the happiest raisins in the Pacific Northwest. This is a lovely sweet bread. I hope you'll try it. Here's the recipe. 1) Scald the milk or heat it on HIGH power for 1 minute in a microwave oven. Sprinkle yeast over warm water in a small bowl. Let sit for 5 minutes to soften. 2) In the bowl of an electric mixer, combine 2 cups sifted flour, sugar, salt and allspice. Whisk to combine. Add yeast, milk and butter. Beat with paddle attachment for 2 minutes at medium speed. Cover and let sit in a warm spot for 30 minutes. When it has doubled in size, add 1 cup of reserved flour and beat with electric mixer on low speed until flour is well blended, about 1 minute. Repeat with the last cup of flour. 3) Turn onto a lightly floured work surface. Knead for 8 minutes, gradually working in currants, raisins and lemon peel. Place dough in a greased bowl, cover and allow to rise until double in bulk, about 90 minutes. Punch dough down. If you wish to add trinkets to dough, add them now. Shape the dough into a round loaf and set it on a greased baking sheet. Cover and let rise again until double in bulk, about 90 minutes. 4) Preheat oven to 350 degrees F. Bake loaf for 45 to 50 minutes. Combine sugar with water and brush over loaf. Cook for an additional 5 minutes. Remove from oven. Let sit for 5 minutes before transferring to a wire rack to cool. Yield: 1 loaf. Lovely post, Mary, and while I love the blue skies, my magpie eye has fallen on that bread! Oh, it looks divine and so cute against that blue check cloth. 1592 - there could be a few spirits hanging around that lovely old spot. Wow that bread looks like another "perfect bite" and I love the story. The bread looks wonderful and I sure could use some good luck around here. That one photo of the tower framed in the arch is just stupendous. So pretty, and calming and serene. Such a lovely bake, Mary! Juz perfect for the coming Halloween festive season. Boy that looks good. Nice post. I always love the info or stories you tell us ....this one, too. The bread looks marvelous and so pretty with the blue. a beautiful bread and thanks for the excellent stories behind the recipe. You've brought some interesting facts along with your BLUES to show us today. I like the idea of placing only "good" items inside the bread. Happy Blue Monday. The bread looks wonderful. I think fresh break baking in the oven makes the kitchen smell heavenly. Thank you for visiting my Blue Monday post. I am going to have stop visiting your post. You are killing me with all that great food and I cannot have any. I visit just to see what you have prepared for the day. Mary... there is nothing like a bit of history to keep a recipe tradition going. But when the spirits of All Saint’s Eve are part of that history; there is always intrigue & mischief, too! Your bread looks fantastic and I bet it taste even better. Thanks for passing along this story & recipe. Carol, I wrap dimes in aluminum foil and bake a few into my loaves of bread. Beautiful bread, Mary! Thanks for sharing it. 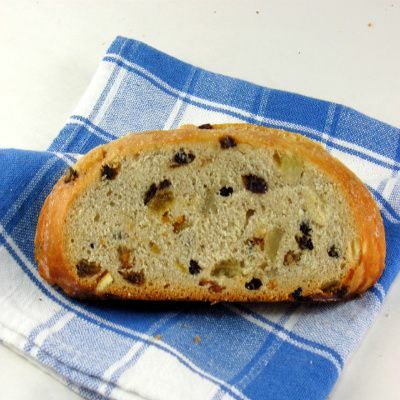 After falling in love with a Greek fruit and nut bread a few weeks ago, I think this one will be a hit, as well. What a bright blue in tne sign there! And the bread looks yummy nestled in the blue checked towel. He kept johnny mack brown�s horse. How about recipes for the whole lot? Wow, Mary - that bread looks absolutely tasty!!! What wonderful blue collage of Trinity College! Love reading about barmbrack and the trinkets!! Great mosaic of Trinity College but I must admit, the bread caught and held my attention. My grandmother and mother have always made soda bread and now I also make it. I did not know about Barmbrack. I hope to make it this coming weekend. Thank you for sharing the history and recipe. The cake is so yummm, nice post. thanks for sharing again the recipe. Happy Blue Monday! Enjoyed this post.Thank you for the recipe,I must try this sometime.Great blue monday post.Happy blue monday Mary.Are you Irish?Just curious. Another great post Mary. I really need to try baking bread - you make it look so easy. I am going to link this post to my blog so that I can make the bread later on. I hope you don't mind. It looks delish! I love trying new breads. This is one I hope to make in the next few weeks....hopefully for Halloween. You always have such a great story to go along with the photo and then you give a recipe to boot. You are spoiling us. I have heard of barmbrack but never knew what it was. Looks tasty - I love the drunken raisins! Charmine, I'm of Scotch -Irish extraction, but learned to cook in German, Scandinavian and Italian kitchens. Go figure. I love baking bread and I love the background information you gave about this bread. I think I will need to bake it. Besides, happy raisins might do a body good! I am happy to be back at my blogging because that means see all your wonderful photos and recipes. I really like the bread and will definitely give my hand a try at it. I can only hope that it turns out as good as your Barmbrack!! Have a great week Mary!! Barmbrack Bread is a new bread to me. It sounds delicious! Thanks for the background and for the recipe. I'm not Irish, but I'd love this! I love your posts because I know I;ll always find not only great bread but a good story or piece of lore as well. And now happy raisins too! Hi Mary! Beautiful blue mosaic! Oh, and your bread looks so delicious! Thanks for popping in to see me. 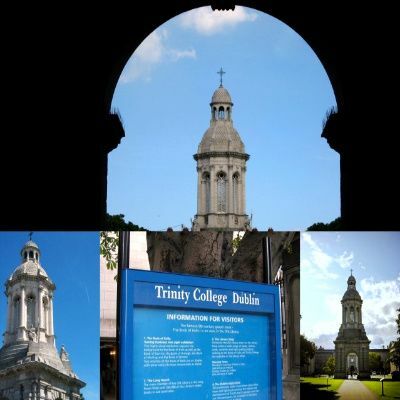 My niece attended Trinity for a semester on the foreign student exchange program and loved it there. And boy does that Irish bread look good. It's gorgeous! This looks like tastey bread. This was such a charming post. I love the sound of the bread, and the blue check pattern meshes so perfectly. I am Irish (and attend Trinity College)...just came across this but thought Id comment anyway! Traditionally the brack would contain lots of objects but now its more usually just a ring (which of course symbolises love!). Also, we have it every year but I would be more familiar with a version that is more of a "tea" cake than a soda bread! What a delicious-looking bread and fun post. Nice fruited bread and a great post. The whole All Hallows Eve thing was mostly the Christians taking the ancient Celtic Samhain tradition and dressing it up in a Christian Halloween costume.Guess this one will be baked this month...with some Irish whiskey soaked fruit! I absolutely love traditional Irish baking--can't have enough recipes like these. Looks amazing, I may make it for Samhain this year!